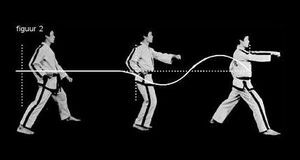 What is Sine Wave in Taekwon-Do? 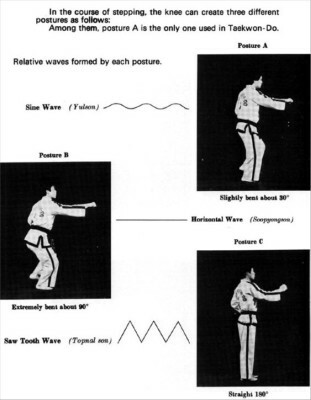 The Sine Wave motion is a movement unique to ITF Chang Hon-style Taekwon-do. It is named for the mathematical concept sine wave, an oscillating up-and-down motion. The intent in Taekwon-Do is to create maximum power in one’s technique by raising and lowering the body during the technique. This gives the Sine Wave style of Taekwon-Do a very “bouncy” look and feel. 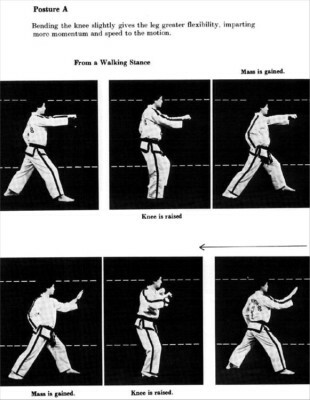 This approach augments the relax-and-tense power principle of Taekwon-Do. Note that not all ITF/Chang Hon-style schools adopt the Sine Wave. The basic motion of sinewave is “down-up-down.” In other words there is usually a downward motion first, followed by an upward motion, and ending in a downward motion. Though the down-up-down motion is often illustrated in an exaggerated way to make it clearer; in practice many schools teach that the motion should be slight, not exaggerated. A proper sine wave starts by going down, not upward! The motion should be smooth and move down, then up, and then crashing down with speed and power. Improper motion is up then down making a sharp ‘Saw-tooth’ motion where you telegraph your motion as well as lose smoothness and power. 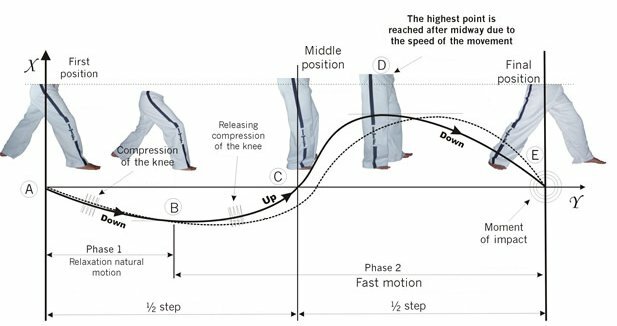 By relaxing and bending the knees you drop your weight and start the forward motion, then continue the motion upward utilizing the knee spring and you reach maximum speed at impact on the down motion which adds more mass into the target. Normal motion (1-1-1) – one full sine wave is completed during each breath. This is seen in Saju-Jirugi, Saju-Makgi and Chon-Ji for example. Continuous motion (2-2-1) – two sine waves during one breath, as part of two consecutive movements. This is seen in Dan-Gun for example. Fast motion (2-2-2) – two movements are performed consecutively in fast speed, with two sine wave and two breaths, as in Do-San. Connecting motion (2-1-1) – two movements are performed in one sine wave and one breath, as in Yul-Gok. Slow motion (1-1-1) – the movement is performed slowly, but according to the theory of power there has to be a slight acceleration at the end of the movement. There is one (slow) movement, one sine wave, in one breath. Slow motion techniques are meant to teach the student body control and balance. This is seen for example in Joong-Gun. Only in normal motion, continuous motion and slow motion there is a full sine wave (down-up-down). In fast motion there is 2/3 sine wave, as there is only an upward and downward movement. An example is found in Do-San: the two punches following movements 15-16 and 19-20. In connecting motion there is 1/3 sine wave, as there is only a downward movement. An example is found in Yul-Gok: the punch which follows movements 16-17 and 19-20.